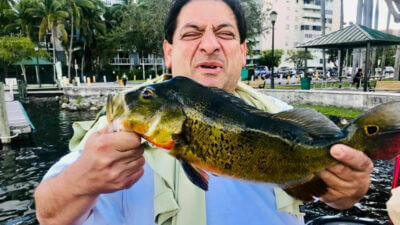 Miami is home to some of the BEST fishing in the state of Florida. One of the many reasons is that it has a vast variety of species you can catch. Freshwater fishing may be overlooked but is a great way to get the family or yourself hooked on fishing. Our local experts take you on a fishing adventure of a lifetime. 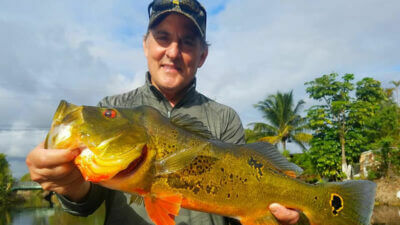 A Peacock bass spawn fishing charter is all you need to get hooked on fishing here in sunny South Florida. 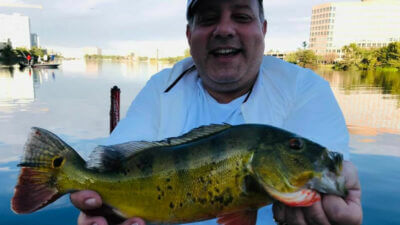 Our local experts have years of knowledge and experience in fishing for peacock bass. You can be comfortable knowing that you are with the most knowledgeable in the business. Also, they are professional, kind and caring to your needs. Always know that you are going to get a great experience and set the hook into the species of your dreams. to accomplish his goals. Luckily, he came down during beautiful weather and the peacock bass spawn! When the peacock bass are spawning, they tend to get more aggressive than other times. Mike cashed in on a trophy peacock bass caught with live bait. This fish weighed in at close to 6 pounds. It was a true beauty and Mike could not have been more excited. Now is the time to catch the big ones! The more the sun shines, the more the bass will bite! Mike will certainly be back for more action in the near future. Captain Miley is looking forward to their next adventure on the water! Just shortly after this awesome fishing adventure, Captain Miley was back on Airport Lakes. This time he had the pleasure of fishing with Robert and his best friend Ernst. They were traveling to South Florida on vacation from Connecticut. Weather has been cold up there and sunny South Florida was appealing. While they were here, peacock bass fishing was a must! Robert and Ernst spent a full day on the water. The action was still hot and heavy. They were catching peacock bass the whole fishing trip with the biggest close to 4 pounds. 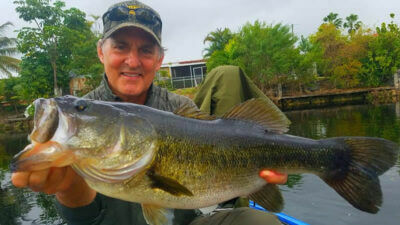 Along with the beautiful peacock bass that they caught, they also landed a giant largemouth bass weighing in at 7.5 pounds. One of the cool parts about fishing Airport Lakes is the true variety of species you can catch. They had an even bigger fish on but it dug into the trees. 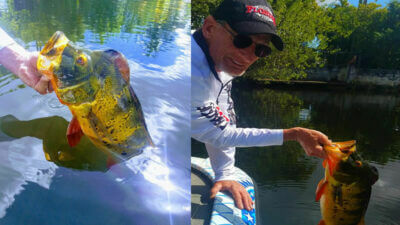 It was not long after this amazing fishing charter that Captain Joe Gruny was on the water at Miami’s Airport Lakes. He had the pleasure and opportunity to fish with Ricky and Stevie. They were visiting Miami looking for an outdoor adventure of a lifetime. Also, they wanted to check out some activities on their bucket list. Ricky and Stevie made the trip fun and filled with laughter. The action was great and Ricky was super excited to finally catch peacock bass. Most of the bass caught were in the weight range of 2-3 pounds. 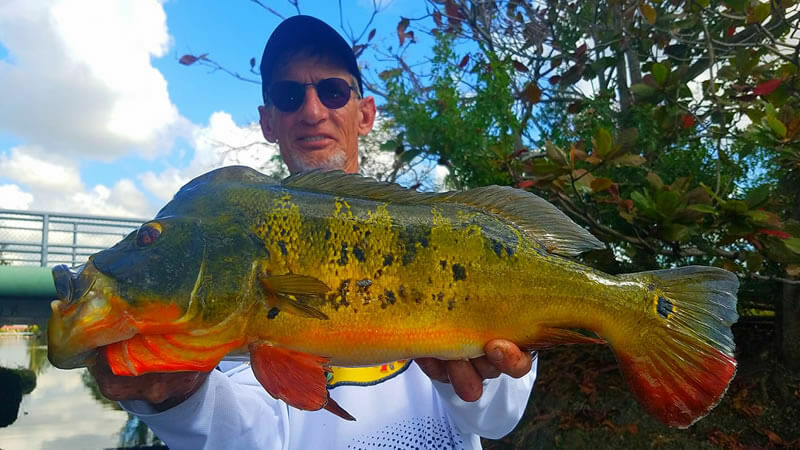 Steady action is all you need to have fun with these aggressive peacock bass. These gentlemen are looking forward to getting back on the water in the near future. Captain Joe will be glad to show them another amazing fishing adventure! for a big peacock bass, you have to experience the spawn. Bring your family or friends along for a fishing adventure of a lifetime! We look forward to seeing you on the water next time! !